Recently I’ve been working on a few older split nut saws and in the process of restoration, I noticed the top corner of the Disston No 7 in hand was docked. My first thought was that the plate had been replaced at some point, as the odds are better you’ll win the lottery than having the holes lining up when swapping out a handle or plate. The results are you need to add/alter the holes or possibly, I was thinking, dock the plate to adjust the fit into the handle. Note to Jr. pickers: be sure to check the plate fit at the handle; it’s easy to overlook a replaced plate. Often on saws with replacement plates they sit proud of the kerf in the handle. Handle removed I realized no alterations to the holes had been made and I was 99% sure this was the original plate. But to quench my curiosity I went to the vault and pulled a few more of similar years and found they all custom pair of Spanx to close up that unsightly gap. And your asking yourself. Why haven’t I read about this you ask?!? For starters we all know saws made in the 1800’s have some of the most intricate handles made, so the idea that the cut is an oversight doesn’t sit well with me. I emailed with a few friends and went to the board for an answer. The net sum resulted in similar suspicions but no real answer. The strongest theory is it helped reduce cracking of the handle. When you look at the force generated in use due to handle shape, hang angle and depth of kerf the pressure at the top corner would be the highest. This would result in the top corner of the plate cracking the handle. Split nuts use small diameter shaft and often bend over time due to the force of the plate. This bending almost always results in a shift backwards towards the hand. If the corner was left on the plate it would surely crack the handle over time. A somewhat weak case, yes. But I put it out there none the less. So what changed in the early 1900’s that allowed for tighter tolerances negating the need for Spanx paving the way to a perfect kerf–to-plate ratio? Are you racking your brain wondering how is it possible that magnificent cover top D-8 with the let in handle is crack free, plus it features a “let in” handle, that surely must tempt the gods! Simply put, BIG NUTS. 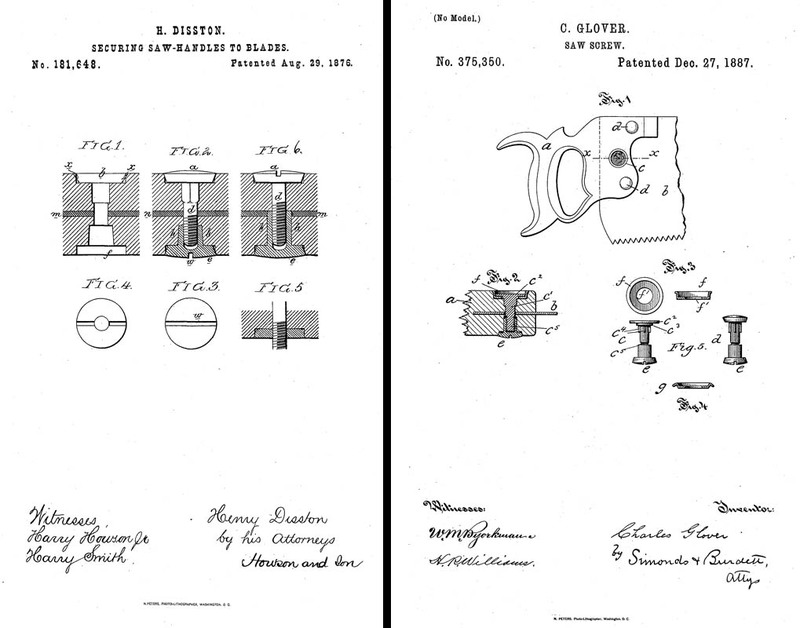 In particular the 181,648 patented by Disston on 08/29/1876 differed from those before them, as they attached with cap screws instead of split nuts. This was followed up by patent 375,350 on 12/27/1887 by Charles Glover of Hartford, Connecticut. The Glover patent screws would eventually become the de facto standard. Lots more can be read here about the evolution of handle fasteners. This is just one mans take based on working with saws but the larger size screws make better quality fasteners, holding tighter, resulting in less plate shifting and therefore less cracking in the handle. With those worries behind them this paved the way for plate fit. I’m sure tons of other benefits went along with this evolution, the least of which is the industrial revolution, but that’s a tale for another time. This entry was posted in Saw Talk by Joe Federici. Bookmark the permalink. This is certainly plausible since many of the older split-nuts are very thin, not only the bolt diameter but the washers were thin in many cases as well. I have to attribute this to the fact that brass was expensive. It does seem a bit odd that makers would build for failure without fixing the real problem, in this case stronger split-nuts. Not all split-nuts were made equal, and some are much heftier.